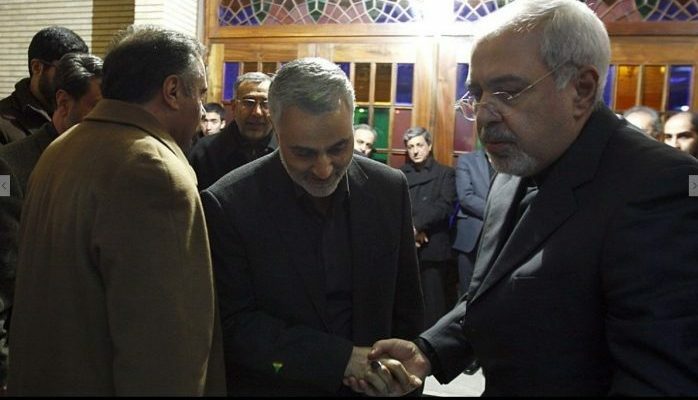 General Qasem Soleimani (Middle) hand in hand with Javad Zarif, in a ceremony after the death of Zarif’s mother. While Iran lobby tries to portray Javad Zarif as a moderate voice within the regime, General Qasem Soleimani, regime’s top commander of the terrorist Quds force, expresses his and the Supreme Leader’s full support for Zarif! 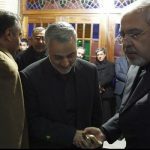 The leader of the Iranian regime’s terrorist Quds Force, Qassem Suleimani, voiced his support for the regime’s Foreign Minister Javad Zarif after the embattled Foreign Minister announced his resignation on Instagram on Monday. Zarif announced his resignation shortly after his noticeable absence during Assad’s visit to Iran. The announcement sent shock waves throughout Iran and the international community and caused controversy among the highest-ranking members of the regime. Regime President Hassan Rouhani refused to accept Zarif’s resignation, and Zarif went back to his office, posing for photo ops this week with an Armenian delegation that was visiting Iran. Suleimani’s excuse that poor coordination led to the exclusion of Iran’s Foreign Minister from an official visit by a foreign President is laughable, but his choice to speak up for Zarif is worth noting. Zarif is often described as a “soft-spoken” moderate” by Westerners, while Suleimani is in charge of the regime’s terrorist campaigns. In a political atmosphere characterized by infighting, this level of support by regime officials from opposing factions is remarkable. Zarif’s resignation and return to office are indicative of the chaotic situation taking place behind closed doors within the highest levels of the regime’s leadership. Rival factions within the regime have been unable to agree on a number of issues, including the Iran nuclear deal, the economic crisis facing the country, and negotiations to retain membership in the Financial Action Task Force (FATF). The regime recently failed to meet a deadline to comply with the requirements necessary to remain a part of the international anti-terrorism group. The debate over FATF regulations has been a hot topic among regime officials for months, with hardliners arguing that the FATF hampered the regime’s ability to make money. Zarif referred to the constant infighting amongst regime officials as poisonous. The conflict does seem to be taking a toll on the public face of the regime. Zarif has had an awkward couple of weeks. He went wildly off topic while answering questions outside of the Munich Security Conference earlier this month and angrily ranted about the MEK in an embarrassing breach of diplomatic protocol. The regime plotted a number of terrorist attacks last year against MEK members in Europe in response to the people’s uprising in Iran and subsequent anti-regime protest movement, which has been largely organized by MEK supporters in Iran. These terrorist plots have been organized using regime diplomats and embassies at the instruction of the regime’s Ministry of Intelligence and Security (MOIS). Zarif’s temper tantrum in Munich came after he was questioned about the regime’s series of foiled terrorist attacks against the MEK last year. While he was being interviewed, hundreds of MEK protesters were standing outside of the conference chanting and holding signs and banners demanding that he go home and calling him a terrorist. Despite the infighting taking place between regime factions, nothing is more important to the mullahs’ regime than presenting a united front when it comes to eliminating the existential threat posed by the MEK.